This entry was posted in Budget, Construction, Construction Manager Battle, Episode 12, Jordan, Qatar and tagged $37.5 million, Budget, fortress, fozan, game of thrones, ibrahim, simon hunter, stages, talal al awamleh, tony harries, uk cm. Bookmark the permalink. The reason I know they have $37.5 million? Ibrahim told me in a meeting at this time that they had $45 million of which 20% would go into ATG’s pocket as its fee. 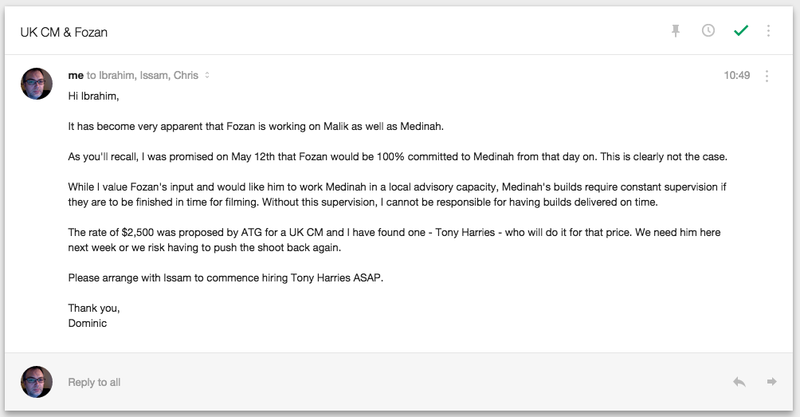 Further to sending this email, no response has been received from Ibrahim. To date, he has ignored all my emails on the subject of a UK CM.